Slow Food for the Soul is the series of colouring devotional print and downloadable books we're releasing in 2017. We loved the idea of the 'slow food' movement that came out a few years ago. It rebelled against the 'quick and instant fix' food that had become so popular, inspiring people to get back to feeding themselves in beautiful, nourishing, thoughtful ways. Today's pace of life is so fast, and only getting quicker, that it can make you dizzy. We think it's time to get into some 'slow food for the soul', mindfully taking time, space and breath as we spend time with God and chew on his Word. We hope that our devotional books will help you do that. creative activities such as music and art. 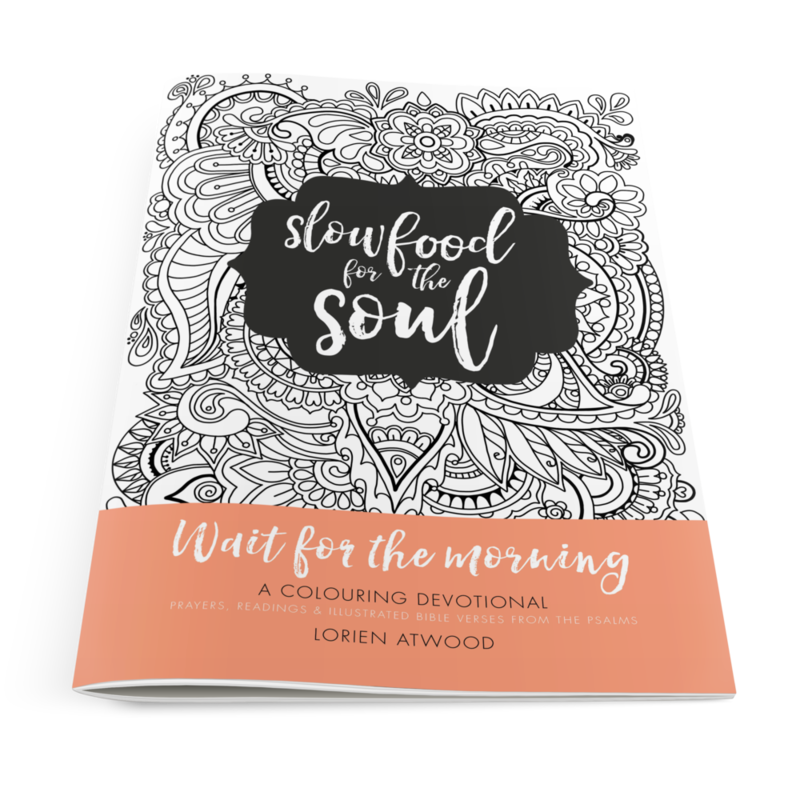 Our Slow Food for the Soul colouring devotionals are flexible enough to be used by individuals for their own quiet times, in a study or fellowship group, or as the basis for a short retreat. You can use all of it, or part of it: it's entirely up to you. If you're someone who struggles with anxiety, depression or chronic illness, and who appreciates Bible colouring because it's less demanding, just enjoy the colouring. New designs, and verses beautifully illustrated by Lorien's incredible designs. If you're looking for someone else's insight into the verse, enjoy the meditation. If you want to be challenged or inspired further in your own thinking, try the questions, prompts and further reading. Our newest Slow Food for the Soul devotional, Wait for the Morning is out now, following the publication of Courage and Comfort and Life in Christ. We have options for physical, print books, or e-books for individual users or for groups. Go here to get your copy.